A grenade is not the best way to stop a drone, but a grenade launcher might be. 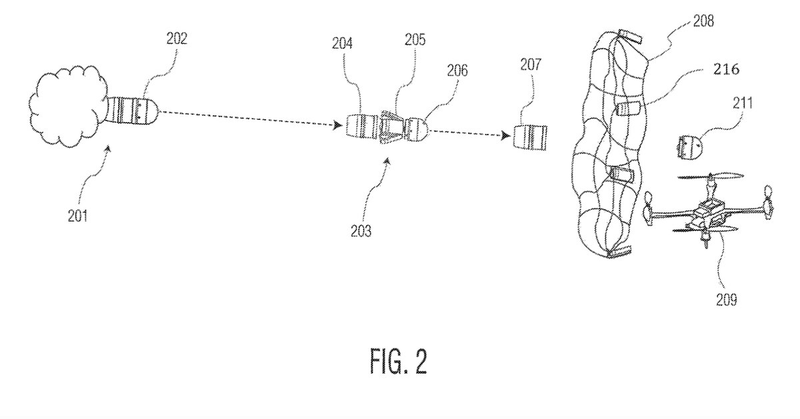 This week, the Army was granted a patent for a net-carrying grenade-sized weapon, designed to work in a standard 40mm launcher, that can ensnare a drone. Formally a “scalable effects net warhead,” the net grenade could finally provide a countermeasure to cheap drones that’s almost as inexpensive as the drones themselves. Ensnaring a robot in a net is perhaps the opposite of lethality, but here that’s a selling point — stopping the drone means immediately disabling it and possibly doing a forensic investigation on the drone’s innards afterwards. Bullets can stop drones, but it’s a hard task even at sport shooting competitions and in a real-life application bullets still have to fall somewhere, risking injury to friendly forces and bystanders. Anti-air missiles like the Patriot can also intercept drones, but drones can be as cheap as a few hundred dollars and missiles like the Patriot can cost a few million dollars. Both more-kinetic options can ruin the drone’s circuitry, obliterating any useful clues as to who may have launched the drone. Nets also hold an advantage over directional jammers in that they only have to hit the drone once to work. Directional jammers, while often portable and rifle-sized, have to stay focused on the target drone until the drone is brought down, or else risk the drone being able to receive signals from its remote pilot and detonate or fly away. Nets are so popular a counterdrone tool that we’ve seen existing net-guns used to stop wildlife re-purposed to catch UAVs, drones carrying nets, drones carrying net-guns, and custom dedicated net-launching bazooka-like weapons. All of these require dedicated training of varying degrees, especially in the case of piloting drones as counterdrone weapons. A net-containing package that fits into a launcher already familiar to soldiers could provide a simpler, easier to adopt way to shoot down drones. This counterdrone net grenade would open when sensors indicate it is close to a target, and then the net inside the grenade would be launched onto the drone. In addition to stopping drones, the patent bills the launched nets as useful against boats, boat propellers, moving land vehicles and stationary land vehicles. If a net could conceivably stop it, then a grenade-launched net is a way to make that happen faster. With cheap drones comes a great opportunity for countering cheap drones. On the battlefield of the future, the answer to drones may just be net-slingers.